Do you have skills to help with this massive agenda? 40 million Nigerians suffer from mental disorders (The Vanguard Newspaper, 2018). 22% of Nigerians suffer from chronic depression (The World Bank, in the Punch, 2018). 1 in 5 Nigerian youths have mental health problem (The Daily Trust, 2018). Yet there are only 130 psychiatrists in Nigeria, which has a population of 174 million and only 9 specialist mental health hospitals. There stands a shortage of skilled health practitioners and mental health experts on the ground in Nigeria and the challenges are only growing without a regular supply of support and expertise. If we are speaking directly to you then we would like to invite you to an upcoming event. 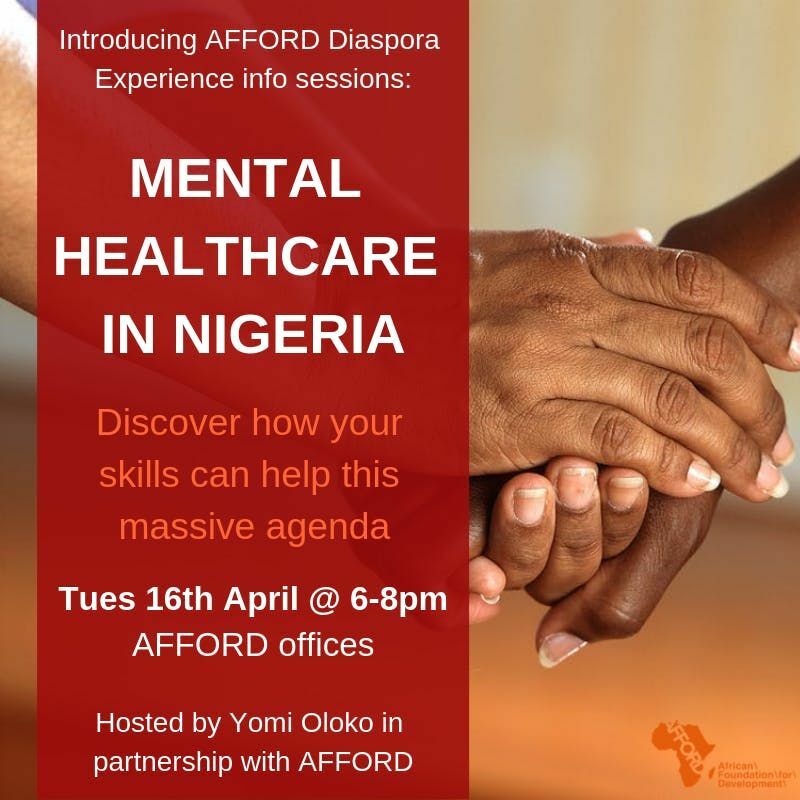 The AFFORD DIaspora Experience are proud to be partnering on a new project as part of our Diaspora Experience program and thus will host a 2 hour evening event with speaker Yomi Oloko. During this event he will share more on this topic and the opportunity that stands for you to be more involved and make a difference in Nigeria. This free seminar kicks off our new info series sessions on Diaspora Experiences you can take part in as your way to give back o Africa via the four gateways we offer. Tihs session is a vital session providing information on the mental healthcare challenges faced in Nigeria by the healthcare there. It will help you identify areas of support that you can give by utilising your own expertise! Come and find out about the Diaspora Experience program as a whole. Tickets are free but spaces are extremely limited so do register to secure your seat now!